Golf & Body Huntington golf services is a focused private environment for improving one’s golf game, entertaining clients, and working on specific skills with a golf professional. The golf experience features a comfortable temperature controlled bay, state-of-the-art golf simulator with the ability to measure critical ball and club statistics including ball speed, launch angle, club face angle, spin rate, and spin axis. 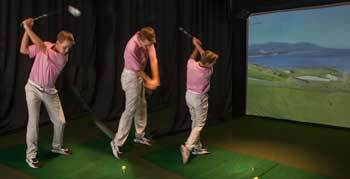 The hitting bay has a high-definition television and high-speed cameras for video analysis.